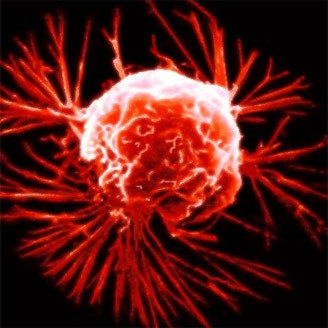 Compared to normal cells, cancer cells have a prodigious appetite for glucose, the result of a shift in cell metabolism known as aerobic glycolysis or the "Warburg effect." Researchers focusing on this effect as a possible target for cancer therapies have examined how biochemical signals present in cancer cells regulate the altered metabolic state. Now, in a unique study, a UCLA research team led by Dr. Thomas Graeber, a professor of molecular and medical pharmacology, together with collaborators, has investigated the reverse aspect: how the metabolism of glucose affects the biochemical signals present in cancer cells. In research published as a featured article online on June 26, 2012 in the journal Molecular Systems Biology, Dr. Graeber and his colleagues demonstrate that glucose starvation — that is, depriving cancer cells of glucose —activates a metabolic and signaling amplification loop that leads to cancer cell death as a result of the toxic accumulation of reactive oxygen species, the cell-damaging molecules and ions targeted by antioxidants like vitamin C. The research, which involved UCLA scientists from the Crump Institute for Molecular Imaging, the Institute for Molecular Medicine, the California NanoSystems Institute, the Jonsson Comprehensive Cancer Center, the Eli and Edythe Broad Center of Regenerative Medicine and Stem Cell Research, and the Department of Pathology and Laboratory Medicine, demonstrates the power of systems biology in uncovering relationships between metabolism and signaling at the network level. The research team also included collaborators from the department of neurology and the human oncology and pathogenesis program at Memorial Sloan–Kettering Cancer Center and the department of pharmacology at Weill–Cornell Medical College.